The Hive of Beauty Spray Paraffin Therapy System uses a spray-on application to soften and condition hands. Here are step-by-step directions to treat hands during a manicure. 1. Prior to an appointment, heat the paraffin cartridges in the heating chambers of the Multi Pro Heater. (One paraffin cartridge will do two sets of hands). 2. Apply your favorite hand cream and massage hands and arms. 3. Split a Hive Polythene Protector along the seam, open it flat, and gently place your client’s hand palm upward. 4. Point the nozzle at a downward angle close to the palm (within 2” to avoid overspray) and quickly coat the wrist and palm with paraffin until no skin shows through. Do the same on the back of the hand. 5. Once the entire hand is covered, lift the edges of the Polythene Protector on both sides and wrap over the entire hand. 6. Place the wrapped hand into a terrycloth mitt and secure with the Velcro fastener. Repeat on the other hand. 7. 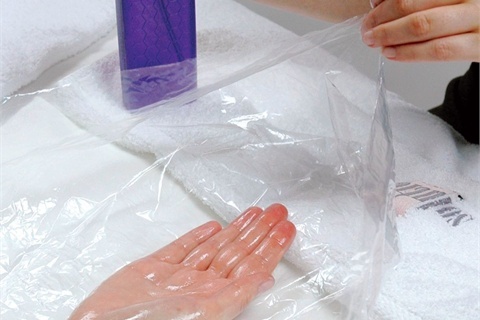 After 10 minutes, remove mitts and loosen the paraffin by gently massaging the client’s hands over the protector. Unwrap the top of the protector and remove the paraffin in one piece like a glove. Turn the protector inside out and use it to dab away any excess paraffin. For more information, visit Hive of Beauty's website at www.hive-online.com.